Preparation time 10 minutes. Cooking time 10 minutes. 1. Pulse blend the frozen vegetables two to three times in a food processor to break them up. 2. Place the pork mince, frozen vegetables, Chinese cooking wine, salt, sugar, pepper and onion in a mixing bowl and mix by hand. 3. Place the wonton skin over the fingers of your left hand and put one tablespoon of filling in the centre of the wrapper. 4. Form a circle withe the thumb and forefinger of your right hand and transfer the skin into the circle and compress lightly to form the wrapper into a loose, four-cornerred hat. 5. You can tighten the circle gently to press the wrapper to the filling and give the dumpling an empire “waist” if you wish. 6. 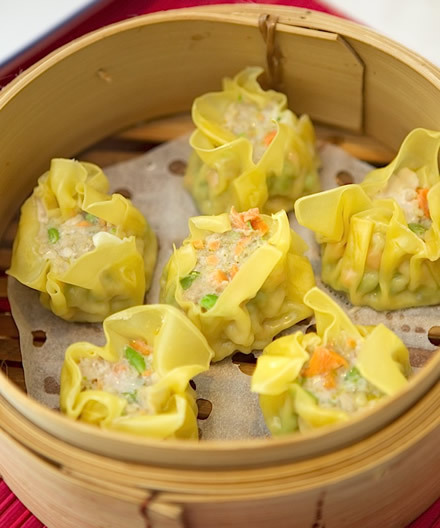 Bring the water to the boil in your steamer, oil the steamer rack or tray to prevent sticiking and place the Shao Mai a little apart from one another. Steam for 10 minutes and serve immediately. Egg skin wonton wrappers are best(from a Chinese grocery store). Serve the Shao mai with light soy sauce, sweet or hot chilli depending on your preference. The dumplings can be prepared ahead of time and stored in the fridge before cooking. Alternatively, you can store them in the freezer and cook from frozen, allowing 5-10 minutes extra cooking time. For 10-12 dumplings: heat to medium a heavy based frypan and add two (2-4) dessert spoons of oil. When warm, place the FROZEN dumplings in one-by-one moving them around the pan to coat the bottom with oil. Place a close-fitting lid over the pan. After two minutes lift the lid and pour water (approximately 25-30 ml per 10 dumplings) over the dumplings and place lid back on. When this water has evaporated pour another 25-30ml over, replace lid. Dumplings are cooked when shape has changed and the dumpling “plumps-up” (approximately 5-7 mins). The skin on top should be translucent (like pasta) and the bottom crisp and brown.